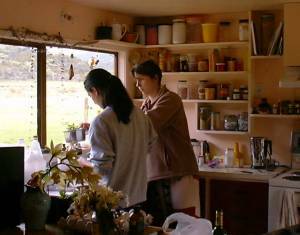 News from the farm in Diggers Valley, for the week beginning 28 September 2002. 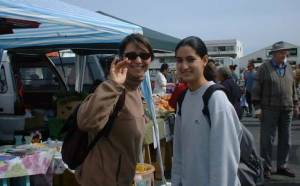 Iphigenie took Ishani to the local market, for a bit more exposure to "authentic Aotearoa". Later they returned to cook us lovely treats. Here's a bit of a flash-back: On the left, the birth day in March and today, six months later. He's obviously sucked all the fat off her bones and shrunk her udder! #343 calved a bull this evening just before 7pm. Mother and baby are both well. At 9.30pm tonight Isla had still not calved. I don't expect she would do so before midnight. (For anyone wondering, there is a sweepstake running on Isla's calving date, hence the frequent reports on her progress. I feel obliged to note exactly when she does have her calf, in the interests of fairness to all those who entered their date guesses. Please think of me at midnight every night, out in the cold dark, often wet fields, checking she hasn't done it at the last possible minute on any date. What dedication. What insanity! 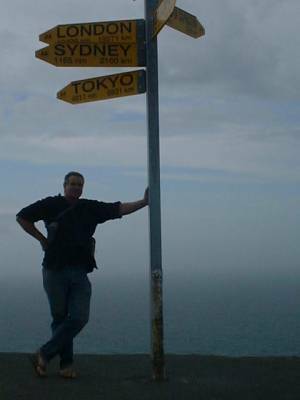 Our visitors suddenly decided to go up to Cape Reinga this afternoon, under the care of their chauffeur, Stephan. I forgot to report a significant event last week. We've been plagued for the last couple of years, by a feral orange tom-cat. He's attacked Cattin (my loyal friend and 'Catriarch' of this establishment) on many occasions, necessitating veterinary treatment over a long period, to fix a joint infection as the result of a bite. We also had a lot of trouble with the cat coming into our house and 'leaving his mark' on walls, bookshelves etc. Very, very nasty. Stephan has attempted to shoot him on at least two occasions but although he thought he'd got him once some months ago, the cat eventually reappeared to continue his attacks. I've been shooting rabbits during the last couple of weeks (they're not a big problem here, but numbers have been rising gradually) so started leaving them as bait for the cat, outside one of our windows. Eventually I saw the cat during one of his dining periods, had enough light to reliably aim the gun at him, and shot him. Unfortunately I didn't kill him outright and unfortunately for him, I was unable to find him in the patch of bush in which he usually lives, to end his injured misery. Feral cats are a real problem for native wildlife. They eat birds and weta, some of which are seriously challenged by such introduced pests. Most wild cats get into bush areas after people dump unwanted domestic kittens and cats on road-sides. Most of them probably don't survive, not being accustomed to fending for themselves, but enough do to continue and expand a feral population which spreads across the countryside and into the native bush. If you have cats and they're not specifically for breeding, please, have them 'fixed'. Little Tiddles might indeed have nice kittens if you let her, but really, you could find any nice kitten anywhere if you wanted one and not have to get rid of the ones you don't want. Not every cat needs to breed. The Native birds and insects of this wonderful land (and the SPCA) will thank you. 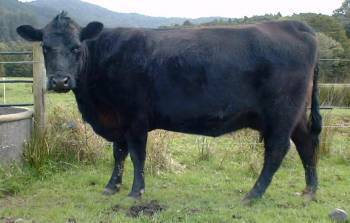 Flower (Taurikura Flower 682) had her second calf on Wednesday, this year beating Isla to calving, despite being inseminated two days later last summer. 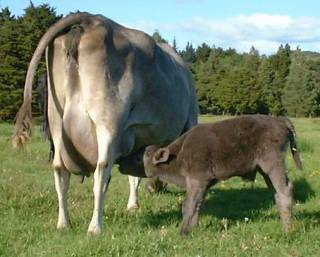 Last year she was 18 days longer in gestation than Isla, with the same bull, inseminated on the same day. This year's calf looks a lot less like a small horse than last year's one. We weigh the stud calves at birth, or as soon as possible afterwards, but Flower's calf didn't get done until this morning because of where she was when she was born and the amount of mud we're still dealing with, which makes transporting the calf to the scales or the scales to the calf, quite a mission. This morning I quietly walked Flower and her heifer calf in to the yards and weighed them both. Here they are on their way to join the other new mums and babies afterwards. Isla is still just Isla. She is showing signs of nearing calving, but oh, so slowly! I feel like my whole life is on hold, just waiting for the event to finally occur. Here she is, early this afternoon. 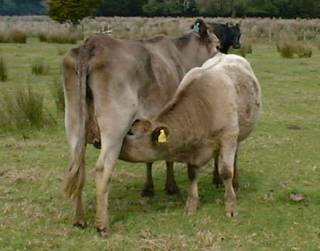 She's definitely looking a bit restless as she wanders around the paddock and her udder is getting pretty tight. Anyone who guessed she'd calve today or tomorrow, might feel some hope of being right. My own guess of over a week ago was obviously way out.